FORT LEE, Va. - An enraged soldier barricaded herself in a building at a Virginia Army base, threw objects around the office and then fatally shot herself in the head Monday as law enforcement officials tried to negotiate with her, authorities said. The soldier, who has not been identified, was pronounced dead after being taken to Virginia Commonwealth University Medical Center, according to a news release issued by Fort Lee, where the Monday morning shooting took place. No other injuries were reported. The heavily trafficked base went on lockdown while the soldier was barricaded on the third floor of the four-story building that houses the Army's Combined Arms Support Command. About 1,100 people were inside, but no one else was hurt, Fort Lee officials said. The Army said an alert was sounded across the post and those in the building either took shelter inside or evacuated as directed. Fort Lee police responded within two minutes of being alerted, the news release said. ``This situation could've been worse,'' said Maj. Gen. Stephen R. Lyons, who took over as commanding general of the support command Friday. The soldier was a sergeant 1st class who has been in the Army for 14 years and at Fort Lee for three, Lyons said. Her gun was not a service weapon, he said. Army officials said they would not release her identity until 24 hours after notifying her next of kin. They did not say if that had happened yet. ``We are sad for our soldier in arms that she faced those kinds of challenges she had to resort to those kinds of actions,'' Lyons said. He said officials did not know whether she was being treated for any mental health issues and could not speculate whether drugs or alcohol might have been a factor. Lyons described the soldier as upset and enraged during the incident but said he couldn't say whether that was consistent with her personality. Fort Lee reopened and normal operations resumed within an hour of the shooting, Lyons said, with trucks and cars entering and exiting the base. The main gate _ closest to the scene _ continued to control traffic, but other gates were operating as normal. The daily population at Fort Lee _ 25 miles south of Richmond and 130 miles from Washington _ is about 34,000, with members from all branches, their families, civilians and contractors. Fort Lee's website says the installation has seen enormous growth and renovations over the past decade as a result of realignment and closures of bases across the U.S.
Army officials initially labeled Monday's incident an ``active shooter'' situation. The Department of Homeland Security uses the term to describe someone actively trying to kill people, usually in populated areas, with no pattern of choosing victims. 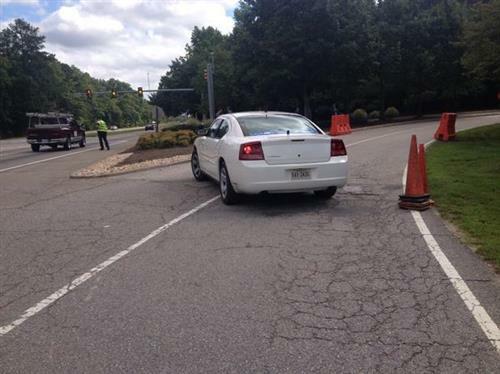 The shooting is the fourth violent act at a Virginia military installation this year. In March, a civilian truck driver shot and killed a sailor aboard a Navy destroyer at Naval Station Norfolk before he was shot and killed by Navy security. In June, authorities said, a sailor repeatedly stabbed another near Naval Medical Center Portsmouth. The same installation was placed on lockdown in April when a sailor shot and killed himself inside a barracks there. Monday's lockdown came days after Fort Lee announced in its official newspaper that a new mass warning and emergency notification system would be activated in the coming weeks. The system allows users to input phone numbers, email addresses or pop-up alerts on any computer that's part of the main Fort Lee network, the newspaper said. Officials said Monday that the system is not yet in place. Associated Press Writer Brock Vergakis contributed to this report from Norfolk. A map with the location of Fort Lee. An active shooter was reported at the Fort Lee Army base in central Virginia Monday morning, and Fort Lee representatives gave the all clear less than an hour later. Officials say the base was put on lockdown and personnel there were told to enact active shooter protocols at about 9:30 a.m. The all clear was give at about 9:50 a.m. The four-story building involved is the headquarters building for the base and houses the Combined Arms Support Command. The base is about 25 miles south of Richmond, Virginia, and about 130 miles from Washington. anyone, but she is uncertain of the shooter's status. down temporarily before an all clear was issued. Pentagon spokeswoman Alayne Conway says the situation is under control. UPDATE: #FortLee says female solider had gun inside CASCOM building. Fired one shot, injuring herself. Her condition not known at this time. CBS National Security Correspondent David Martin is reporting that the situation in Fort Lee is now over. There is one wounded, believed to be the shooter. On Fort Lee Facebook: An all clear has been issued by the Fort Lee installation operations center at 9:50 a.m. The law enforcement event is over. The U.S. Army says the shooting is at the headquarters for Combined Arms Support Command. CASCOM, which located at the base, "trains, educates and grows adaptive sustainment professionals; develops and integrates innovative Army and Joint sustainment capabilities, concepts and doctrine to enable Unified Land Operations," according to its website.